IDEAS in Mexico: A new chapter for evaluation? Our chapter captures some of the rich discussions held at the Centre for Development Impact (CDI) over the years, as well as a fascinating panel session at the last IDEAS Global Assembly in Bangkok. Firstly, we argue that evaluators need to get out of their ‘methodological box’! The past decade has seen fascinating debates on the more technical aspects of evaluation; whether rigorous impact evaluation, or complexity, or evidence for adaptation and learning. Yet, it has also been a period where rising inequality, conflict and insecurity, mass migration, terrorism, and climate change all present major challenges for our time. While the Sustainable Development Goals provide a useful framing of the challenge, it will require far more than a donor-led effort to achieve them. As such, we argue that evaluators need to respond to new demands for evidence: no longer just Western donors to southern counterparts, but emerging national-led priorities for evaluation, as well resource flows from investor and the scrutiny of business value chains. And secondly, we argue that not only do evaluators themselves need to adapt to a changing world, but they could also support other (more marginalised) citizens to adapt. Indeed, responding to the great global challenges of our time will require more than just methodological improvements and innovation. We argue instead that there is a need for a bolder evaluation agenda: one in which evaluators recognize their potential role in contributing to transformative change. After all, evaluators can do much more than simply present evidence: they can use evidence to support transparency and accountability; engage a range of very different interests, support inclusion, raise the voice of the marginalised, and “speak truth to power”. 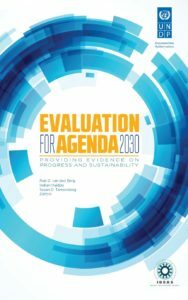 We conclude that the next decade needs to see evaluation (and evaluators) making more of an ethical and value-based standpoint: to support change, improve learning, and challenge the status quo! The IDEAS Global Assembly in Guanajuato, Mexico this week focuses on the challenges, new methods, approaches and evaluation capacities required to evaluate the SDGs, providing a rich contribution to these debates.